So don't expect Activision to rethink its strategy. Guitar Hero II owners moaned and they groaned, about the price of song packs, the choice of music, and that they had to buy them in bundles, and yet they've still been downloading song packs off Xbox Live Marketplace in their thousands. Since April, Activision has sold around 650,000 song packs for Guitar Hero II over Xbox Live, making for a total of more than 2 millions songs, according to new numbers out this week. What's pulling fans online? Apart from songs that debuted in the first Guitar Hero that were later released on the Xbox Live Marketplace, Xbox 360 owners have also been looking to new packs, such as the one by My Chemical Romance. Released in the middle of August, this single pack has been downloaded more than 50,000 times in less than a month. 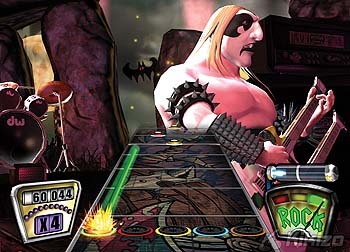 The success of downloadable content in Guitar Hero is good news not just for Activision, which will be making a more concerted push with songs to buy online in Guitar Hero III, but also EA, which is rounding off work on its own music game, Rock Band, developed by Guitar Hero creator Harmonix. Sony, too, is eyeing music as an important online draw. The SingStar series, one of the most popular PS2 franchises in Europe, is coming to the PlayStation 3 soon and at its heart is a download store where people will be able to buy extra content. For Activision, the trick now is to ensure that its next Guitar Hero game, now in new hands and with brash competition, will still hit the high notes. The owners of the 5.5 million Guitar Hero games will be looking for something special.